Streetfront headed down to Seattle early on Saturday November 24 for their annual marathon trip. We met at the portable at 5:45 am, with our ID; running shoes and sleeping bags ready to go. After a quick stop at the outlet malls, we boarded the bus and went straight to the Marathon Expo and volunteered for 4 hours. After that, we went to a restaurant to fuel up in preparation for the big day. We woke on Sunday to cloudy skies but were ecstatic that it wasn’t raining. Those running the Half Marathon were ready to go at 7:30 am and the Full Marathon kids started at 8:15 am. Its always inspiring to see these young kids, all with incredible person stories, lace up their shoes and do something that almost no other kids would ever think of attempting. 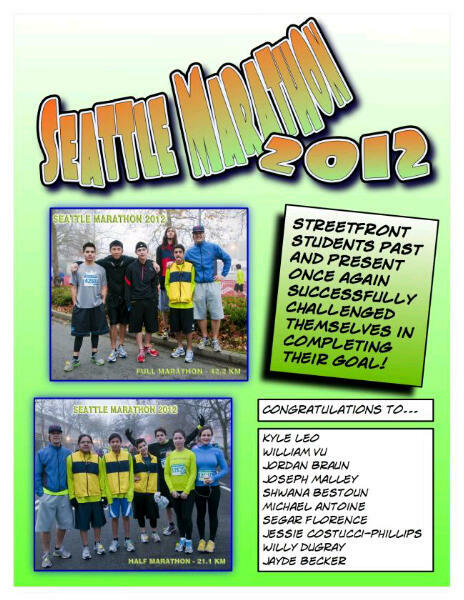 We at Streetfront are so proud of all their efforts and can’t wait for Vancouver in May 2013. Scotiabank Vancouver Half Marathon completed!